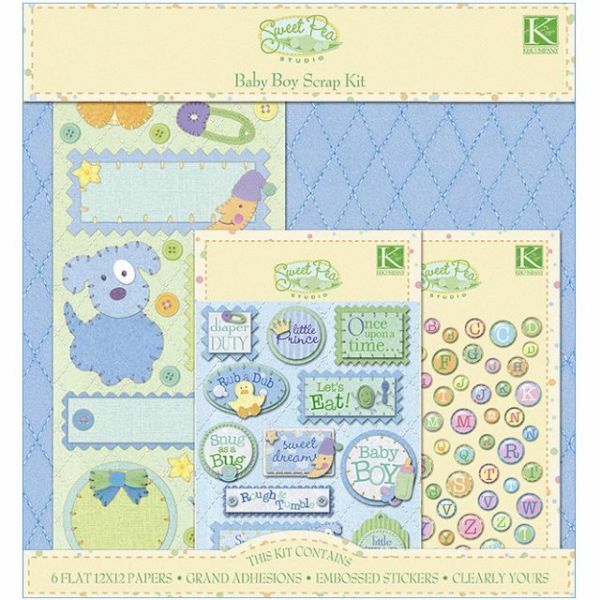 Sweet Pea Scrapbook Kit - K&COMPANY-This adorably sweet collection is perfect for sharing baby's milestones and precious memories. Everything is blue, yellow, and green for boy colors and color coordinating. Includes (6) 12x12 patterned papers, 1 sheet of 3-D stickers, 1 sheet of domed alphabet stickers in uppercase, and one die cut sticker sheet. Acid and lignin free. Archival safe.